Holy Mackerel! Gluten-Free Battered Fish! What would you say if I told you that affordable, frozen, gluten-free crispy battered fish entrees are available nationwide in your grocer’s freezer case? Just last night in the grocery store, I, for one, almost fell over when my gluten-mongering husband-type unit blurted “Look Honey, gluten-free!” and held up a box of Oven Ready Gluten-Free Cod by Starfish. There were also boxes of Haddock and Halibut available. 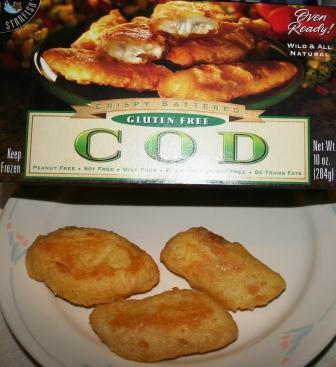 The cod was priced under $5.00 for a 10 ounce box, so we decided to try that. Now, you need to understand that in our current apartment, we have an extremely old gas stove, so the results may differ with a newer and/or electric one. We raced home and popped them in the oven. 14 minutes later, out they came. On the box it states there are 3 servings – we felt it was more like 2 – which is what we were expecting anyway, so that is not a criticism by any means. One side was a golden brown, the other side paler, again, I believe, due to the old gas stove. These golden medallions of batter-encased fish were crispy on the outside for certain! The inside was a little doughy, but no more than a tempura-style batter. The fish was somewhat flaky – definitely not spongy. 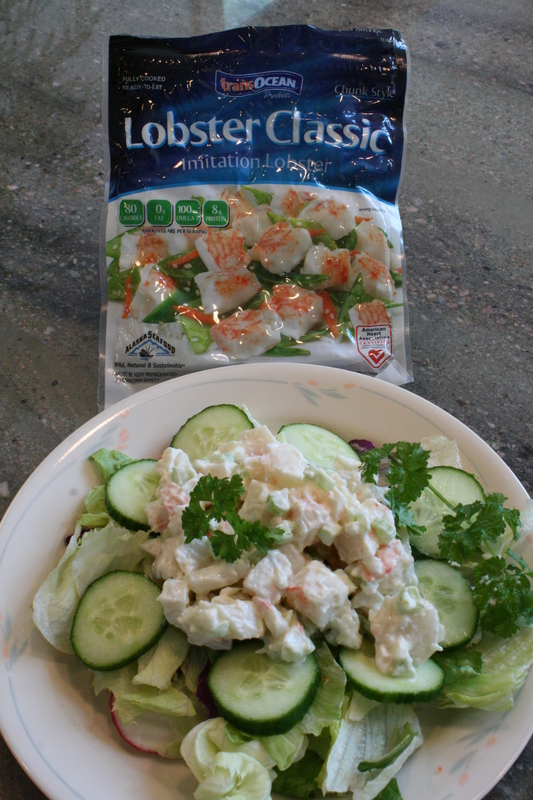 No grit, no strange taste and no mush: they had a buttery flavor that even the non-Celiac at the table enjoyed. This product is peanut-free, soy-free, milk-free, egg-free, wheat-free and has 0 grams of trans fats. I thought the pricing was reasonable – and these products are available nationwide at your Whole Foods store, or at smaller local venues on the West coast. If you’ve been missing fried foods – here is your fix! Enjoy. More information is available about Starfish and their gluten-free fish entrees at www.star-fish.com. Ever have a shock that just messes you up? That happened to me last Wednesday while I was shopping at Wal-Mart. I was in the baking mix aisle looking for the Jiffy Cornbread Mix for my gluten-mongering spouse when my sight unintentionally fell on something completely unexpected: Betty Crocker Gluten-Free Brownies. Say what? Damn straight. You heard me right. I did a double-take. I stood frozen in the aisle behind my cart. No frikkin way…really? Gluten-free brownies by…Betty Crocker? I had to have read it wrong. So I touched the box to make sure it was real. It was, indeed. $3.79 was the price. I don’t tend to bake gluten-free brownies, but I had to try this out, so I gingerly placed it in the cart. It was time to go to produce, but I still couldn’t move. What exactly did this mean? As mainstream as Betty Crocker, and as universal as Wal-Mart: were Celiacs finally getting the service we have been asking for? Or are the numbers of gluten-intolerant people becoming so staggering that a conglomeration as large as Betty Crocker saw a profit potential there? Part of me was incredulous on a happy level, while another part of me was stunned by the possible gravity of it. Then I started to feel a little badly for the companies who have supported Celiacs all along, producing gluten-free cooking mixes because they cared. And now, here was Betty Crocker, jumping on the band wagon, getting prime real estate at Wal-Mart, and selling the mix for only $3.79 (compared to $5.00 and more for other brands). How are the little companies who have supported folks suffering from gluten-intolerance going to compete with this? What about Pamela’s, and Bob’s Red Mill, and all the other “little guys”? These companies started producing gluten-free foods long ago. How will they compete…and survive? So, I will try one batch of these Betty Crocker Gluten-Free Brownies in order to review them. I understand that many people do not have access to small health food stores which carry gluten-free products, or the internet, but do have a Wal-Mart in their town. But my heart will be with the little guys who were there for me when I was first diagnosed and didn’t know what to do. Stay tuned for Part Two…The Product Review! Okay, it was time to try out the Betty Crocker Gluten-Free Brownie Mix. Part of me was reluctant, as I mentioned in Part One, because if this mix turned out to be good, that meant trouble for the “little guys” like Pamela’s and Bob’s Red Mill. And since I have been eating more healthily with less gooey sweets, brownies were really not on my diet. But the box had been sitting on the counter, staring at me, daring me to try it despite the horrendous stove in my apartment. I accepted the challenge. The directions are incredibly easy. The mix requires only eggs and melted butter. Betty Crocker’s web site even offers butter-free directions for non-dairy diets. The directions state that the “batter will be thick.” That is an understatement. They offer three different size pans; don’t even THINK about doing anything larger than the smallest: the 8×8 pan. It is so thick and elastic-like that you couldn’t spread it any farther if you had to. I’m not kidding. 31 minutes later, I pulled my little square pan of brownies from the oven. I let them cool most of the way, then tasted a sample. Honestly, I have to say, these brownies were incredible. Thick, rich, moist, chocolately, and I really couldn’t tell that they were gluten-free. There was no grittiness whatsoever. They were crispy on the outside and chewy on the inside. I covered and refrigerated them, and they lasted for about a week between myself and my gluten-mongering spouse. He actually found them to be a little too rich for his taste. I did notice that I would cut 1 inch squares for a quick snack and that would more than fulfill any food or chocolate craving. After being refrigerated for a few days, they did become somewhat fudge-like and if you don’t seal them tightly (as it instructs to right on the box), they will get pretty crispy/stale. The three plusses are there: inexpensive (compared to other gluten-free brownie mixes), easy to prepare, and delicious. So, that is my verdict: Betty Crocker’s Gluten-Free Brownie Mix is a winner.